As I write to you that on Wednesday morning (January 23), I have several things that I would like to convey. On Sunday afternoon I received word that The Reverend Canon Malcolm Nāea Chun passed away suddenly in his home on Halekoa Drive. Since the announcement of his death by the diocesan support center, we have received countless messages of condolence here in the Cathedral office. Malcolm was much loved by this community and I know that this is a big loss for us. For me personally, I remember Malcolm’s reaching out to me in 2001 to ask if there was anything he could do to support me as I made plans to engage in my seminary studies. 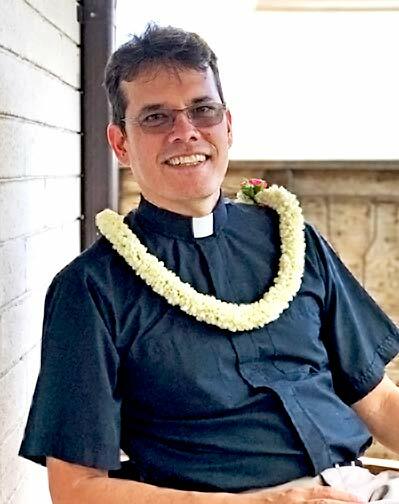 Malcolm also extended a personal invitation to me to take part in his priestly ordination during the time that I was living and working in Hilo. I was very honored to be there on that special day and to take part. Please rest assured that we will keep you posted on any plans for funeral services. Right now Bishop Fitzpatrick is away on pilgrimage in the Holy Land and we should have firmer plans after he returns at the end of the month. This afternoon I met with Barbara Service and Warren Wright and we discussed the Cathedral Sandwich Ministry, which the Outreach Committee would like to revamp. Plans are in place to begin the first Sunday in Lent (March 10) and the committee is looking for people to help in making and delivering the sandwiches on Sunday mornings. I would like to ask you to prayerfully consider lending a helping hand and if you feel called to this ministry to please let Barbara Service know. Yesterday evening the Cathedral Chapter met and approved the minutes from the December 2018 meeting. They also accepted the Treasurer’s report. I am attaching both documents here for your review and ready reference. Please note that we do not have financial statements available for December 2018 as we are working to close out the books, which is somewhat time-consuming at the end of the fiscal year. Thank you for understanding. Please remember that the annual meeting will be held this coming Sunday, January 27th in the Tenney Theatre at 9:00 AM. During the meeting we will take in a presentation on the 2019 budget, elect Chapter members, elect delegates to the diocesan convention, and elect a Junior Warden to fill out the remainder of Warren Wright’s term. I received and accepted Warren’s resignation as Junior Warden earlier this month. Please mark your calendars for Sunday, February 3 at 5:30 PM in the Cathedral sanctuary for an Evensong in honor of Candlemas. The Orvis Music Scholars and the Cathedral Choir will provide the music that evening. I will be traveling to Japan and the Philippines next week and will not be here for services on February 2 and February 3. Father Hee will preach and preside at all services that weekend. While I am in the Philippines I will take a day to go out to St. Andrew’s Seminary in Quezon City to conduct a two-hour session on daily life as a parish priest for seminary students. I look forward to meeting and working with the seminarians and I’m excited about providing a report to you about my time with them when I return.